The book of Revelation is the most developed example of a scriptural writer wrestling with the ideological implications of the gospel, and engaging with an opposing system in the light of what God has done in Jesus. It is an apocalypse, a letter and a prophecy. Ian Paul gives disciplined attention to the text, examines how John draws on the Old Testament, indicates how his message would have communicated and been understood in its first-century context, and makes connections with our contemporary world. 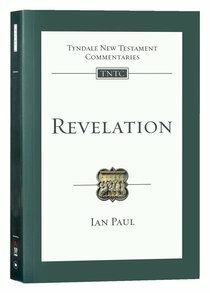 About "Revelation: An Introduction and Commentary (Tyndale New Testament Commentary Re-issued/revised Series)"
The book of Revelation is the most developed example of a scriptural writer wrestling with the ideological implications of the gospel, and engaging with an opposing system in the light of what God has done in Jesus. It is an apocalypse, a letter and a prophecy. Ian Paul gives disciplined attention to the text, examines how John draws on the Old Testament, indicates how his message would have communicated and been understood in its first-century context, and makes connections with our contemporary world.